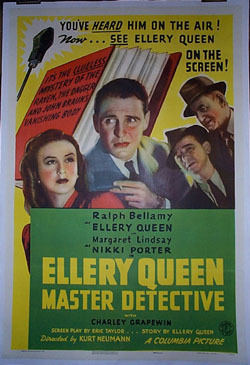 This is the complete Ellery Queen movie series from 1935 to 1942. The series started in 1935 w/Donald Cook produced by Republic Pictures. In 1937 comic Eddie Quillan took the role. Then in 1940 Columbia produced a series of 7 films. Ralph Bellamy starred in the first 4 and William Gargan in the last 3. These are rarely seen and hard to find films. All copies are from 16mm film transfer.